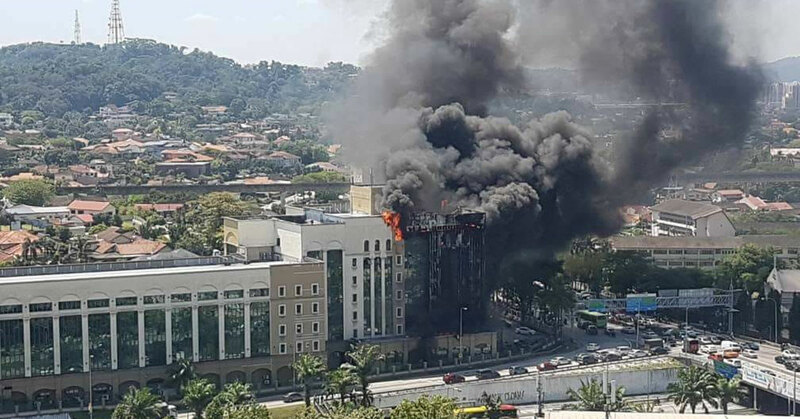 Earlier today, footage of the Kumpulan Wang Simpanan Pekerja (KWSP) building in Petaling Jaya on fire surfaced amongst Malaysian netizens, with many sharing images and videos on various social media channels. And at around 1.25pm, KWSP’s Corporate Affairs Department released a statement on their Facebook page confirming the incident and announced the closure the PJ branch until further notice. They also announced that their Crisis Response Team was working closely with the Malaysian Fire and Rescue Department to contain the blaze and ensure that no further damage was done to surrounding areas. “As safety of customers and staff is our prime concern, total evacuation of the building has been taken, and office and counter services are closed until further notice,” said the statement. Members of the public have also been speculating about whether their savings held by KWSP are safe, or about their data. Comments on Facebook from netizens. This attitude was also called out by another netizen. However, the KWSP post also assured members that data integrity was maintained and that member savings were not compromised as a result of the fire. It is currently unknown how many were injured or if there were any resulting fatalities caused by the fire, but we will include any relevant updates here once they are released. Members and employers who wish to perform any transactions with the KWSP are advised to contact or visit the nearest KWSP branch. Alternatively, members may call the KWSP Contact Management Centre at 03-8922 6000 or forward their enquiries through the myEPF website. Update: There have been rumours circulating online that KWSP will be halting all withdrawals for six months as a result of the fire damage. KWSP has already denied these rumours in a statement provided to Malaysiakini.